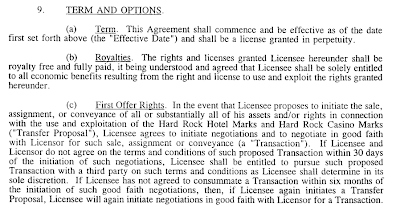 Here’s a case caption that gives you pause: “Hard Rock Cafe International (USA), Inc. v. Hard Rock Hotel Holdings, LLC et al.” Ryan Gile at the Las Vegas Trademark Attorney has done the heavy lifting on figuring out who sued whom and why. It’s a license relationship gone sour: the original trademark owner sold the mark and became a licensee, then sold the license to another company that now stands accused of acts that harm the value of the brand. That’s exactly the reason one normally wouldn’t allow the assignment of a trademark license without approval. But you can’t second guess what leverage anyone has in negotiation, particularly when licensing back to the original trademark owner. 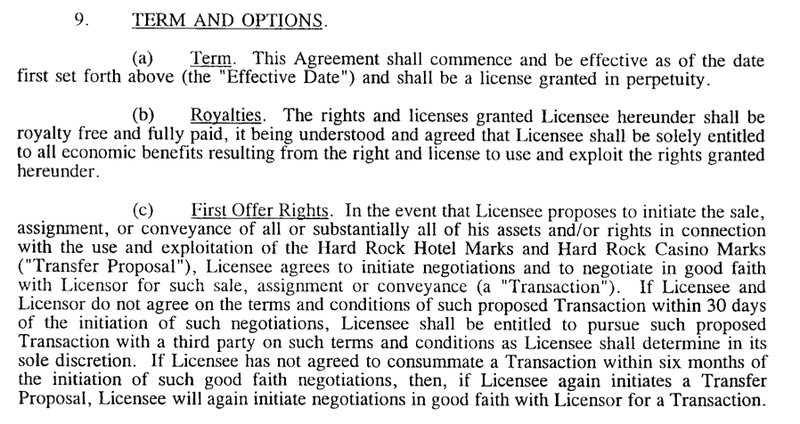 Hard Rock Cafe Int’l (USA), Inc. v. Hard Rock Hotel Holdings, LLC, Case No. 10-cv-07244 (S.D.N.Y. Sept. 21, 2010).